Photographer: Rakesh Datta, MS, Pune, Maharashtra, India. 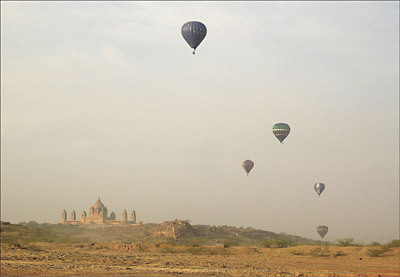 Umaid Bhawan Palace, the royal palace of Jodhpur, provides a beautiful backdrop for a hot air balloon carnival. Located on the edge of the Thar Desert in the north Indian state of Rajasthan, Jodhpur was a citadel of the Marwar kingdom from the 15th to 20th centuries. The Umaid Palace is a recent addition to the royal architecture, built from 1929 to 1943 as a drought relief measure that provided work for citizens of neighboring poor villages.